Please note that the content of this book primarily consists of articles available from Wikipedia or other free sources online. 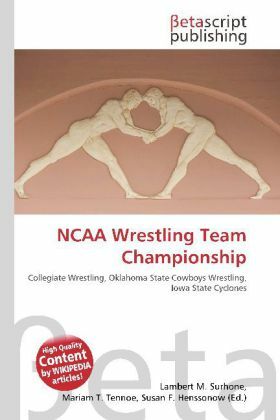 The National Collegiate Athletic Association (NCAA) is a semi- voluntary association of 1,281 institutions, conferences, organizations and individuals that organizes the athletic programs of many colleges and universities in the United States and Canada. Its headquarters are located in Indianapolis, Indiana, and was under the leadership of president Myles Brand until his death on September 16, 2009 from pancreatic cancer. In August 1973, the current three-division setup of Division I, Division II, and Division III was adopted by the NCAA membership in a special convention. Under NCAA rules, Division I and Division II schools can offer scholarships to athletes for playing a sport. Division III schools may not offer any athletic scholarships. Generally, larger schools compete in Division I and smaller schools in II and III. Division I football was further divided into I-A and I-AA in 1978. Subsequently the term "Division I-AAA" was added to delineate Division I schools which do not field a football program at all.